Chen interned in the Office of the Associate Librarian, where she provided general support for Ransom Center programs and services. She is a graduate of the School of Information at The University of Texas at Austin. 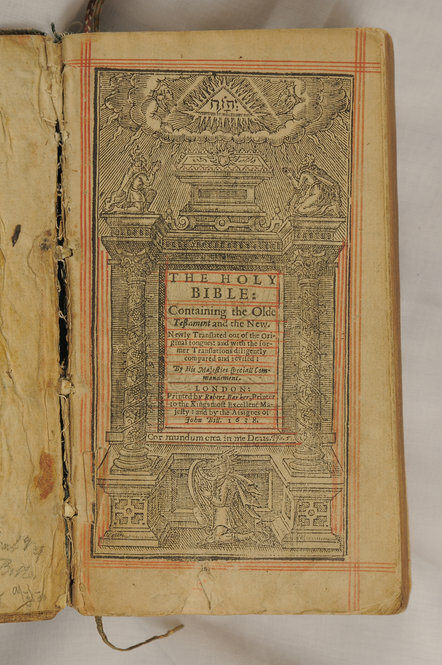 Among the Harry Ransom Center’s collection of early printed Bibles is a 1638 edition of what is arguably the single most influential English translation of the Bible, the King James Bible. 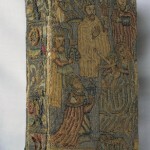 This Bible’s front and back covers are embroidered with a nativity scene in silk and silver thread on linen. Mary, seated and holding the infant Jesus, is the most imposing and central figure in the scene. 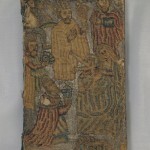 At her feet are the three Magi presenting gifts to the Christ child, while Joseph, clad in a red-and-white striped costume, stands behind her. 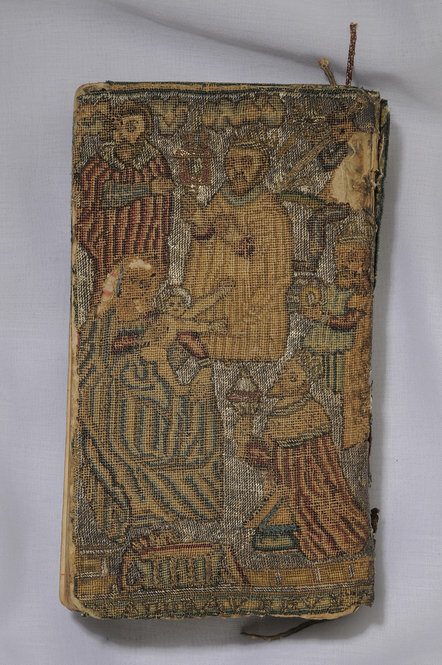 At the bottom of the front cover is embroidered the Latin word “obtulerunt” (they offered), and on the back, “adoraverunt” (they adored), terms that refer not only to the actions of the Magi, but also, perhaps, to the devotional work of the embroiderer. 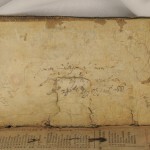 The book’s binding provides several clues about the embroiderer’s identity. 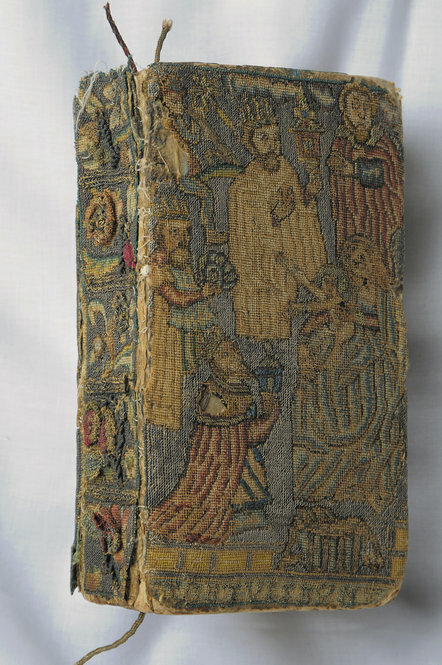 The embroiderer would most likely have been a female member of a wealthy family who could have afforded the luxury goods of silk and silver with which the book was covered. Though there were professional male embroiderers at this time, embroidery was a formative component of girls’ education, and women were the main producers of embroidered household furnishings in wealthy households, including cushion covers, bed hangings, clothing, and book covers. That Women-kinde should use no other Pike [i.e., needle]. To use their tongues lesse, and their Needles more. But sharpnesse of the tongue, bites out of measure. The acts of Jonah in records of gold. The needle, then, was also seen as a tongue or a pen with which women could participate in public dialogue with and about the world. 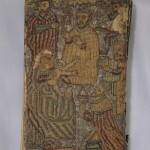 Mary’s prominence in this Bible’s embroidered scene, for example, is no accident. The most popular sources of pictorial embroidery in the seventeenth century were Biblical stories of heroic and virtuous women. 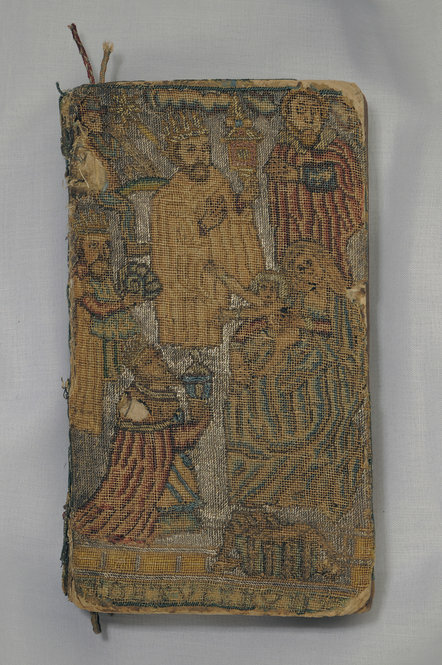 That the intimate and domestic nativity scene on the cover of this Bible is also one of public worship by the Magi makes it a fitting representation of the simultaneously private and public roles of domestic needlework and its maker. The embroiderer of the Ransom Center’s 1638 Bible would also have been someone of artistic sensibility. Placing the family against a background of silver thread recalls the painterly practice of situating holy figures against a metallic background to highlight their otherworldly qualities. 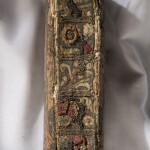 The flowers and leaves on the spine are examples of raised work, a very popular embroidery style in the seventeenth century. Its three-dimensional effect is part of the contemporary trend towards textured effects in other artistic media. We welcome readers’ advice in identifying the particular stitch this embroiderer used here. 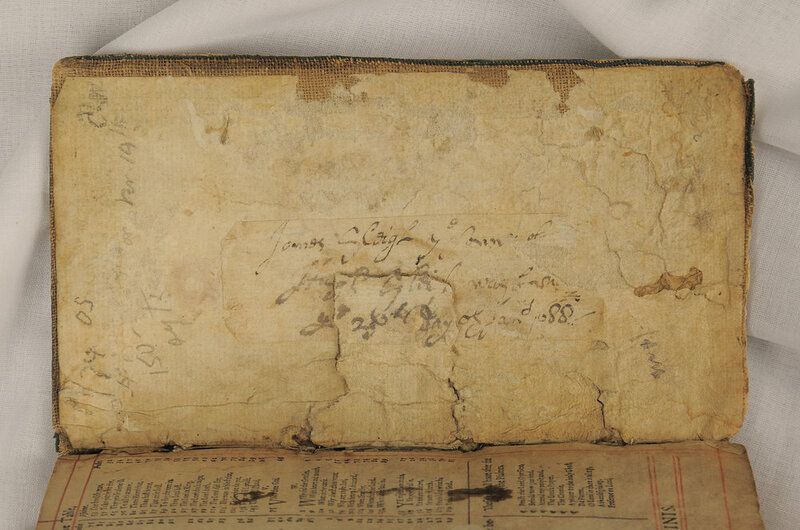 Finally, thanks to the numerous marks of ownership inside the book, we may even know the needlewoman’s last name. Written on verso of the title page to New Testament is the inscription: “John Sleigh, Inner Temple. 12 Nov AD 1850.” Written inside back cover is the note: “James Sleigh ye sonne of Hugh Sleigh was born ye 26th [?] 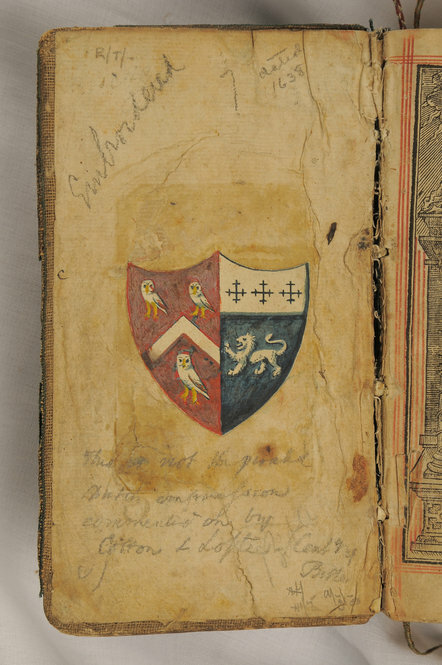 day of Jany 1688.” And inside the front cover is pasted in a hand-drawn shield that includes the arms of the Sleigh family of Derbyshire, England. This artifact’s text, annotations, and decoration thus combine to enrich our understanding of women, domestic life, economics, reading practices, art, religion, and material culture in seventeenth-century England. Brooks, Mary M. English Embroideries of the Sixteenth and Seventeenth Centuries in the Collection of the Ashmolean Museum. Oxford: University of Oxford, 2004. Jewitt, Llewellyn, ed. The Reliquary, vol. 7. London: Bemrose & Lothian and John Russell Smith, 1866-7. Jones, Ann Rosalind, and Peter Stallybrass. “The needle and the pen: needlework and the appropriation of printed texts.” In Renaissance Clothing and the Materials of Memory, ed. Ann Rosalind Jones and Peter Stallybrass. Cambridge: Cambridge University Press, 2000. Morrall, Andrew, and Melinda Watt, eds. English Embroidery from The Metropolitan Museum of Art, 1580-1700: ’Twixt Art and Nature. New York: The Bard Graduate Center for Studies in the Decorative Arts, Design, and Culture; New York: The Metropolitan Museum of Art; New Haven: Yale University Press, 2008. Parker, Roszika. The Subversive Stitch: Embroidery and the Making of the Feminine. London: Women’s Press, 1984. The Holy Bible, HRC BS 185 1638 L5 1638. Printed by Robert Barker, London, 1638. Size: ca. 6 x 3.5 in. Cover materials: silk and silver thread on linen. Front cover of the Bible. The photo captures the sheen of the silver thread used as background for the Adoration of the Magi scene. Silver thread is also used to depict the infant Christ’s halo. 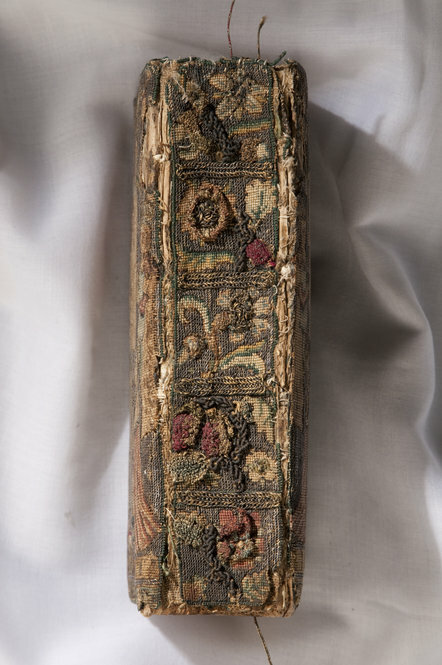 Spine of the Bible. The three-dimensional raised embroidery work on the spine was a popular needlework style in the seventeenth century. 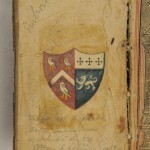 Inside front cover of the Bible, showing the arms of the Derbyshire Sleigh family on the left half of the shield. Title page of the Bible. The red ruling has been done by hand, which was a convention of manuscript production. Before the advent of the printing press, ruled lines not only guided scribes as they wrote across the page but also became part of the understanding of what a book should look like. 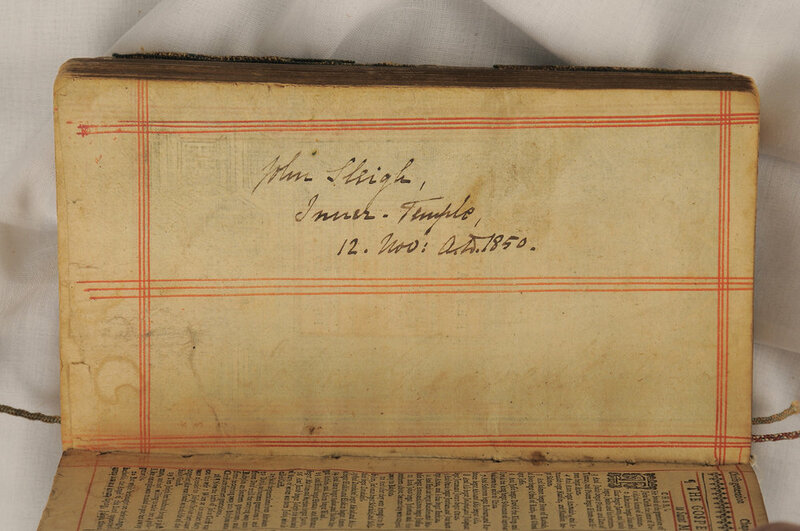 Inside back cover of the Bible, with the inscription “James Sleigh ye sonne of Hugh Sleigh was born ye 26th [?] 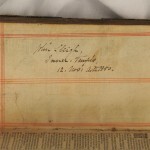 Day of Jany 1688.” Bibles were often used to record family histories. 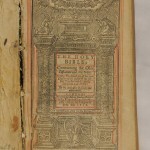 Image: The Holy Bible, HRC BS 185 1638 L5 1638. Printed by Robert Barker, London, 1638. Size: ca. 6 x 3.5 in. Cover materials: silk and silver thread on linen.